I ask that you enter my thoughts and clear the negative strongholds. Take charge of my thoughts, ideas, and understanding. Calm the worries that torment me and break the yolk of negativity. This I pray in Jesus precious name. I have found these words most helpful and comforting, to say the least. I hope you will, too. Thank you so much for your words of encouragement cali. 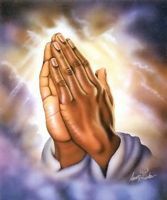 I've been praying and asking the lord to heal my thought life. When I'm fearful and anxious I know the lord is most close. I'm reading the word of God daily and finding peace. I do pray and find that God protects me when the enemy attacks me in my thoughts. again, thank you for your words. it helps me much on my journey. Allow me to advise you: when one deals with stronghold in one's life, one has to close all doors and windows, which gave access to evil in your life. In other words, all thoughts, what you say, feel and do. Do this prayerfully and ask the Holy Spirit to cut off the bondages for you. Then go for confession with your priest, so that the Lord can sezal you with his forgiveness and with the Holy Spirit. Afterwards, when you feel a thought or word coming, deny it entrance by rebuking it in the name of Jesus Christ! Very soon you will feel and experience the victory. God is faithful and he loves you! All the best and may Jesus bless you.